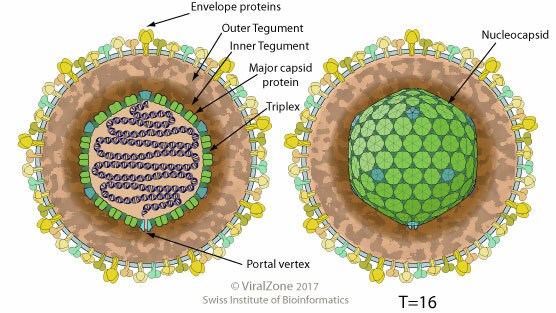 Each viral transcript usually encodes a single protein and has a promoter/regulatory sequence, a TATA box, a transcription initiation site, a 5' leader sequence of 30-300 bp (not translated), a 3' untranslated sequence of 10-30 bp, and a poly A signal. There are many gene overlaps. There are only few spliced genes. Some of the expressed ORFs are antisense to each other. Some ORFs can be accessed from more than one promoter. There are some non-coding genes. ANTIVIRAL DRUGS Nucleoside analog valaciclovir. This drug is activated by the viral specific enzyme, thymidine kinase, and are therefore specific to herpes-infected cells. It acts against the replicating virus (they are incorporated into the DNA as it is copied) and is ineffective against a latent virus. Epstein-Barr virus protein BNLF2a inhibits host adaptive immune response by interacting with TAP1 and TAP2 and thus preventing TAP-mediated peptide transport and subsequent loading. The glycine-alanine repeat domain (GAr) of Epstein-Barr virus-encoded nuclear antigen 1 (EBNA1) prevents major histocompatibility complex (MHC) class I-restricted presentation of EBNA1 epitopes to cytotoxic T cells. Epstein-Barr viral protein BHRF1 is a viral homologue of the Bcl-2 oncogene that is able to protect cells from induced apoptosis. EBNA3C directly interacts with host Gemin3 and thereby blocks p53-mediated apoptosis . The viral Bcl-2 homolog BHRF1 in addition to prevent host cel death, may also control host autophagy . EBNA3C forms a complex with Cyclin D1 thereby facilitating the G1-S phase transition . Additionally, EBNA2 can affect activities of cell cycle regulators and retards cell cycle progression at G2/M phase. The conserved UL24 family of human alpha, beta and gamma herpesviruses induces a cell cycle arrest at G2/M transition through inactivation of the host cyclinB/cdc2 complex. EBV encodes an UL24 homolog termed BXRF1 that should perform this role . EBV inhibits the cascade leading to production of interferon-beta by targeting host IRF3 protein with the BGLF4 protein kinase that directly interacts with and inhibits host IRF3. BRLF1 expression also decreases induction of IFN-beta, and reduces expression of IRF3 and IRF7. EBV EB2 modulates the host mRNA expression by exporting unspliced mRNA, thereby inducing alternative splicing .